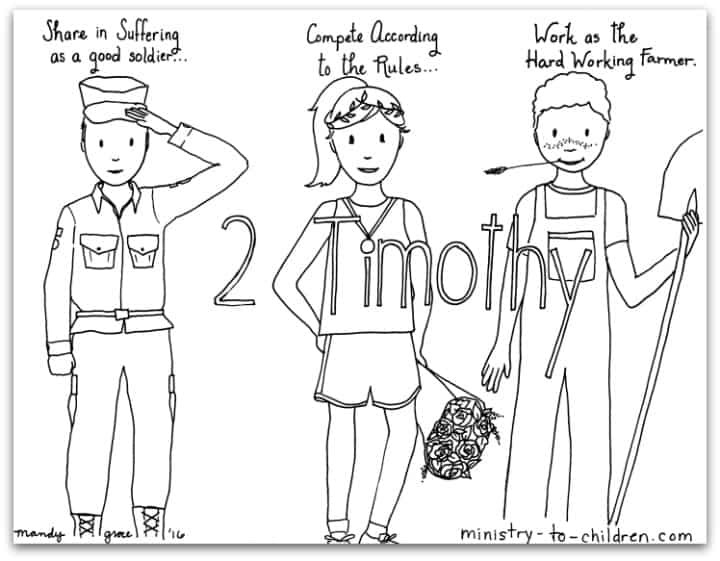 This free coloring page is based on the Book of 1 Timothy. It’s one part of our series of illustrations for each individual book of the Bible. The illustration captures the theme from 2 Timothy 2:3. It shows three children to illustrate the caption. Share in suffering as a good soldier … compete according to the rules … work as the hard working farmer. If you are teaching about the books of the Bible, you will also enjoy this review worksheet about Paul’s New Testament letters. Don’t miss all our printable Bible coloring pages for kids. This might be a good coloring page for a Veteran’s Day.